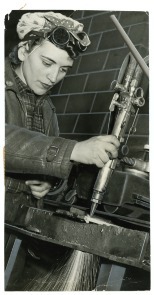 Richmond St. and Norris St.
Mrs. Marie McCloskey, who here is acetylene-burning test plates in the apprenticeship school at Cramp's shipyard, is one of 60 trainees who learn their job in two to four weeks. School is on 24 hours a day. Mrs. McCloskey has two children, 7 and 9, but she felt it was her duty to take up some of of war work.